Since its inception in 2013, Falcon Insurance Company has experienced rapid growth and diversification. Now writing in three states, the company wrote over $52 million in 2016. To accommodate their growing number of policyholders and the resulting claims, Falcon has increased its claims staff to over 50 personnel and opened a claims office in Dallas, Texas. As with any company’s swift success comes some growing pains, and there became a need to identify and implement new and efficient ways to manage and process the increased volume. In times like these, a technology partner can bring expertise and a fresh perspective to help identify and develop improved business processes. 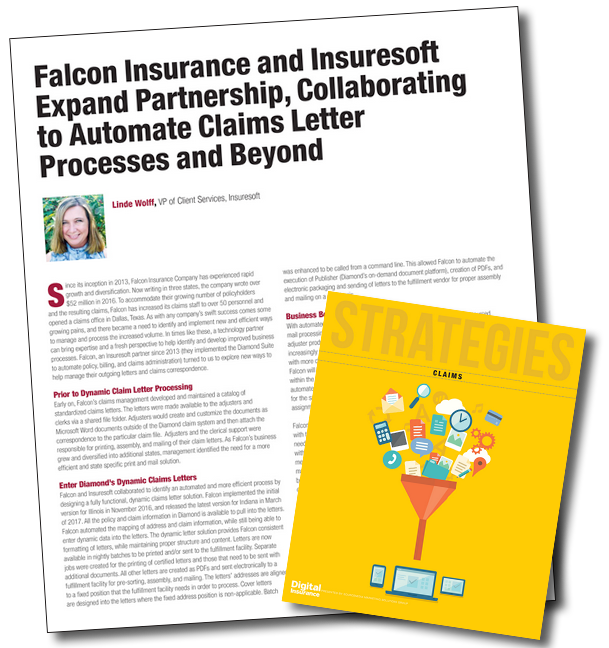 Falcon, an Insuresoft partner since 2013 (they implemented the Diamond Suite to automate policy, billing, and claims administration) turned to us to explore new ways to help manage their outgoing letters and claims correspondence. Early on, Falcon’s claims management developed and maintained a catalog of standardized claims letters. The letters were made available to the adjusters and clerks via a shared file folder. Adjusters would create and customize the documents as Microsoft Word documents outside of the Diamond claim system and then attach the correspondence to the particular claim file. Adjusters and the clerical support were responsible for printing, assembly, and mailing of their claim letters. As Falcon’s business grew and diversified into additional states, management identified the need for a more efficient and state specific print and mail solution. Falcon and Insuresoft collaborated to identify an automated and more efficient process by designing a fully functional, dynamic claims letter solution. Falcon implemented the initial version for Illinois in November 2016, and released the latest version for Indiana in March of 2017. All the policy and claim information in Diamond is available to pull into the letters. Falcon automated the mapping of address and claim information, while still being able to enter dynamic data into the letters. The dynamic letter solution provides Falcon consistent formatting of letters, while maintaining proper structure and content. Letters are now available in nightly batches to be printed and/or sent to the fulfillment facility. Separate jobs were created for the printing of certified letters and those that need to be sent with additional documents. All other letters are created as PDFs and sent electronically to a fulfillment facility for pre-sorting, assembly, and mailing. The letters’ addresses are aligned to a fixed position that the fulfillment facility needs in order to process. Cover letters are designed into the letters where the fixed address position is non-applicable. Batch was enhanced to be called from a command line. This allowed Falcon to automate the execution of Publisher (Diamond’s on-demand document platform), creation of PDFs, and electronic packaging and sending of letters to the fulfillment vendor for proper assembly and mailing on a daily basis. With automated dynamic data letters Falcon has fully transitioned to an outsourced mail processing facility. Falcon’s utilization of the dynamic letter process has increased adjuster productivity an estimated 10-15%. With the increase in efficiency, employees are increasingly satisfied with their ability to focus on managing claims and not having to deal with more clerical functions. Showcasing the power of Diamond with this successful effort, Falcon will look to expand their partnership with Insuresoft to help optimize other functions within the claims operation. Falcon has several projects in progress now, including automated identification of coverage issues, SIU scoring, and improved vendor integrations for the salvage and appraisal processes. Future collaborations include automated adjuster assignment and automated work plan and productivity tracking. Falcon is now equipped with an automated letter management process that will adapt with their growth for years to come. This project began with a conversation around a need for efficiency, and resulted in a successful endeavor saving Falcon time and money within their claims department. At Insuresoft, we consider ourselves “purposeful partners”, meaning we are with you every step of the way to help solve business challenges and make you more successful. Falcon is a great example of how working together can bring efficiencies way beyond the original scope of a core system integration. We are creating innovations for our partners. They rely on us to bring the highest standards, and innovative solutions that stand out amongst the competition. Is your core system provider a purposeful partner? First published in Digital Insurance Strategies Claims magazine.